Endurance is the story of Shackleton’s expedition to the pole, its failure and the incredible adventure of coming back alive. Alfred Lansing does a great job in conveying a mix of entertainment and lesson learned -mainly in leadership and leadership mentality-. Endurance is the story of an adventure. It’s a bit like a romance or a science fiction or a novel, and I believe it makes little sense to summarize a novel. 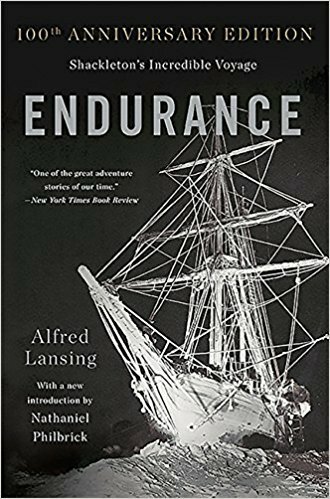 This summary of Endurance by Alfred Lansing then is more based on the lessons I lead from the book. In August 1914, Ernest Shackleton set sail with the ship Endurance with destination Antarctica, South Pole. The idea was to cross Antartica, which back then was the last uncharted continent, on foot. In January 1915 however the Endurance was locked and eventually crushed in the ice. That’s when the ordeal began. The crew took on a journey of 850 miles. First on the ice pack, where they fed with penguins and seals. And then they finally took the ocean on the heavy South Atlantic’s sea on 3 small lifeboats. They landed on a small desert island first, Elephant Island, where two boat crews stayed while Shackleton too on another sea-borne trip to the island of South Georgia, hoping to find human life there. Luckily, they find a boat crew there. A crucial man in the expedition was also the cartographer, who managed to find a small dot of an island in the huge expanses of sea. He thought he had gotten them into that situation and it was his responsibility to get them out. As a consequence he was intensely watchful for potential troublemakers who might nibble away at the unity of the group. There is some romanticizing in the story. For example, about crossing by foot the island South Georgia the author writes “a feat never before accomplished”. But of course it’s “never been accomplished”: there is no incentive and, well, nobody lives there. It’s a crazy crazy ride of a book. It will keep you glued to your book as you dream of your own explorations :). Honestly I don’t mind much about the story in itself. To me, it’s barely about heroism too: heroes is saving people while those guys were looking for their kicks -and let’s be honest, probably for fame, too-. There are also plenty of adventurous stories and ultimately I think people should busy themselves in living their own life rather than reading others’. To me the biggest takeaways of Endurance is in leadership and leadership mentality. That mentality is one of taking responsibility for the people you lead (also read Leaders Eat Last). And that’s what Endurance by Alfred Lansing can teach us all. The second biggest takeaway, looking at how often these men were close to not making it, is that sometimes life is random and luck plays a big role. Also read Fooled By Randomness and The Black Swan.